Just wanted to highlight a great deal: for the next week, the online version of the ESV Study Bible can be purchased for just $5.99. Normally the price is $19.99 for eternal access (well, for the duration of this present evil age…), and I think even that is a good deal. 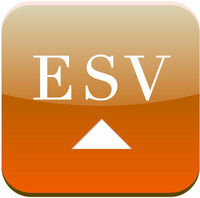 Or, online access code is included with purchase of a hardcopy ESV Study Bible. Obviously the ESV is the translation of choice of the Reformed, and the ESV Study Bible is the official study bible of the Reformed, in particular of WSCAL-o-philes. I requested my hardcover ESV Study Bible as a Christmas present when they were new (I guess that would be 2008), and ever since I’ve been a frequent user of the online version. But if I had it to do over again, instead of dropping a dollar-per-pound on the hardcover I would have bought the supermini pocket ESV (my current bible, which I got after the wheelbarrow that I used to carry around the study bible broke), and paid $20 for the online study bible. In addition to the expected benefits of faster computerized searching, and clicking around to chase down cross-references, I also found that it was distracting to have the whole study bible there in church — I would be distracted from worship by all the notes and articles and pictures and maps and such. So if you have somehow not yet jumped on the bandwagon of the ESV Study Bible, now’s the time to do it! This entry was posted in Books, Education, Plugs, Westminster Seminary. Bookmark the permalink. Question: Is the ESV Study Bible actually a Reformed study Bible, or would the Reformation Study Bible (ESV) be a better choice? Thanks for the post either way. That’s a good question! I don’t know much about the Reformation study bible — because it didn’t get as much press from Reformed “superstars” as the ESV study bible did. But that is also evidence for the thesis that there’s nothing really special about the ESV, it’s just a slight edit of the RSV (? ), plus tons of marketing to make people believe it’s the translation to end all translations. As Clark notes, perhaps the Reformedest study bible of all is the original, the Geneva bible!